I have the privilege of being a Guest Designer for The Crop Stop blog. I have enjoyed participating in their challenges (I'm linking to the current challenge) and was really happy when Karen asked me to guest design for them. I enjoy using many of the products that are carried in the Crop Stop store. I love to try new techniques so I thought that this was a perfect opportunity to try this Emboss Resist technique. I've seen it several places on the web but here is a great how-to video from Gina K of Stamp TV. This is the video that inspired my cards. She uses Zig brush markers but I substituted Distress inks and markers with great results. I had so much fun, I couldn't stop with just one card....I had to make two! On watercolor paper, I scribbled a Chipped Sapphire Distress Marker in various places. I didn't take any care, I just was laying down color. Then, using an ink blending tool, I added other colors of distress inks all over the watercolor paper. I didn't try to blend them. Again, I was just laying down color. Then using a water brush, I softened the edges of each color and did a little simple blending. I dried this with my heat gun. Then, using Versamark and clear embossing powder, I stamped a swirly image randomly all over the image and heat embossed it. I then generously spritzed the entire piece with a mini-mister. I let the water sit on the surface for about 45 seconds and then blotted it off with a paper towel. The vibrant colors were trapped under the clear embossing but the rest of the distress ink started to lighten up considerably. I continued to spritz and blot until I was happy with the colors. I then let them air dry. I kept the embellishments pretty simple so that I wouldn't cover up too much of the pretty background. The first card is a standard A2 size and uses some fantastic glitter paper from DCWV. The second card is 5" square an has a recessed sentiment. I hope you will stop by the Crop Stop for your stamping needs. They carry a wide variety of items from many of the popular manufacturers. Thanks to Crop Stop for allowing me to Guest Design for them. It was so much fun!! It's time for another challenge at Word Art Wednesday. This week our verses are from the book of Psalms. Psalms 8: 3,4 state, "When I consider thy heavens, the work of thy fingers, the moon and the stars, which thou hast ordained; What is man, that thou art mindful of him? and the son of man, that thou visitest him?" Have you ever visited a planetarium and seen the representation of the vastness of space, all the galaxies and millions of stars? Have you ever considered that the God that made all of that is the same one that loves and cares about you and what happens in your life? This is the same God that wants you to spend time with Him and tell Him all about your day. That just totally boggles my mind. Who am I that He should love and care about me? And you know....He loves you too and wants to have a relationship with you. You could just start the conversation with Him with, "Thanks for the beautiful sky you put above me." This time I obviously focused on the stars part of our verse. I used some distress inks on watercolor paper to color a night sky. I spritzed it with watch and dabbed that off with a paper towel. I also spritzed it with shimmer spray to give a little sparkle. 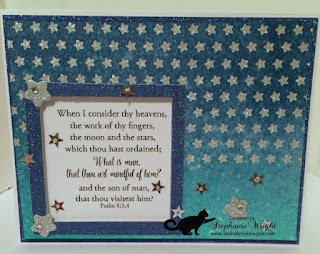 I used a retired MFT Peek-a-boo Stars die to cut rows of stars in my inked background and then backed it with glitter paper. A squre die cut window allows the focus to be on the verse. 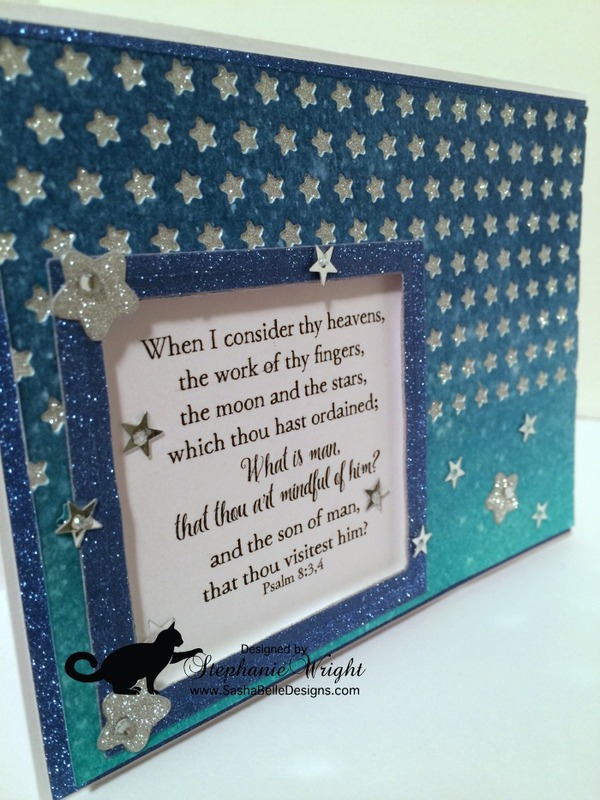 The verse cut-out was framed with blue glitter paper. The entire panel was matted on blue glitter paper and then adhered to a white card base. Some stars cut from glitter paper using the Simon Says Stamp Christmas Cats die set were scattered on the card front. Each one has a small rhinestone for some extra sparkle. Some star sequins topped with Star Dust Stickles finish it off. Many of the items used on my card this week are available at our fantastic sponsor Simon Says Stamp. Thanks for stopping by to visit today. 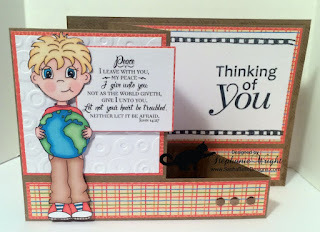 I hope you will check out the rest of the design team projects at the Word Art Wednesday blog and also visit Simon Says Stamp for some great new products. I'm listing the products used below using affiliate links where possible. These links provide a small commission for me at no cost to you. For retired products, I will list similar current products below. I could not find the exact glitter paper from DCWV that I used online. The glitter paper I listed is a close match. I apologize for being late getting this week's Word Art Wednesday challenge post up on my blog. My husband and I have been sick and I've been struggling to keep up. I think we are finally on the mend but it's been a long two weeks. For this week's challenge our focus verse is John 14:27, "Peace I leave with you, my peace I give unto you; not as the world giveth, give I unto you. Let not your heart be trouble, neither let it be afraid." In this verse, Jesus is talking with His disciples and trying to prepare them for His departure after the Resurrection. He was telling them that He would leave them with a Comforter and give them peace. Not the type of transient peace that the world tries to offer but the deep, solid, lasting peace that comes from knowing that God is in control and is taking care of things. Because they would have the Lord's peace, they had not need of fear or worry. Wow! Sounds like what we need today doesn't it. Every day when you turn on the radio or TV or open your newspaper or web browser you find some new calamity, drama-filled situation or catastrophe. However, when we accept the Lord's peace we can go through life without fear or worry. God is in control. When we read our Bibles we can know the ending ahead of time. God wins!!! One of our sponsors this week is Imagine That Digistamps. I used one of their FREE "try before you buy" sets called You Are My World. Since I was not feeling well, I chose to use one of the pre-colored images in the set. I printed out the boy and the globe and then fussy cut him out. I went around the edges of this panel with a 100 Copic marker. I saw this Fancy Fold Box Card by Deb Valder on YouTube. It carries a nice WOW factor but is still very easy to put together. I thought it would be great for this week's card. I embossed the panel behind the boy and the Scripture with a Cuttlebug Spots and Dots embossing folder. Some "nail head" embellishments finish off the front. 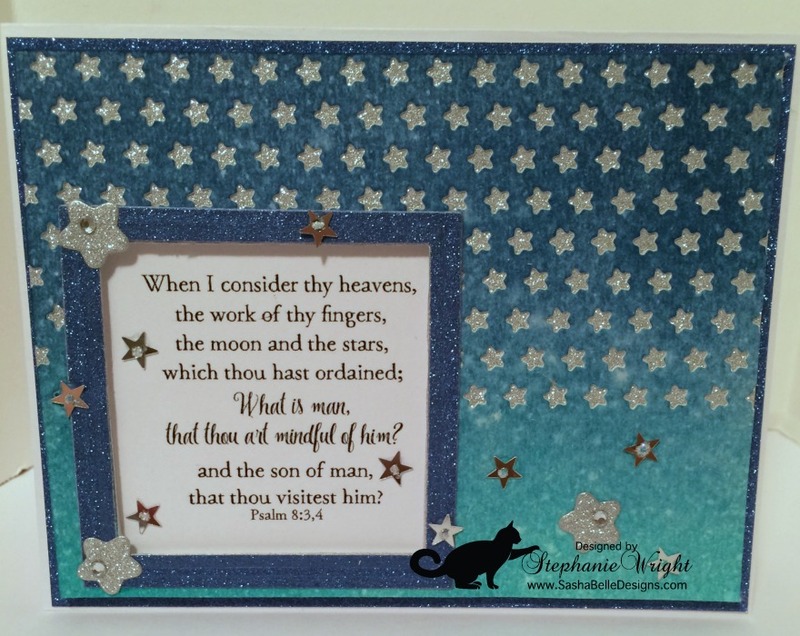 I used a sentiment from Dare 2B Artzy and a border stamp from Dylusions to decorate the other rectangular panel. 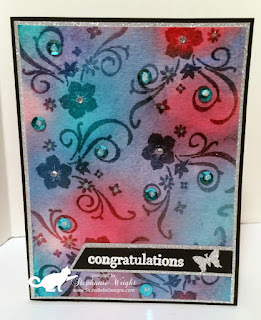 The Dylusions stamps were new so I prepped them using some Versamark Ink according to a suggestion by Jennifer McGuire in this blog post. There is a spot inside the card for a message and another message could be written next to the stamped sentiment if you wish. 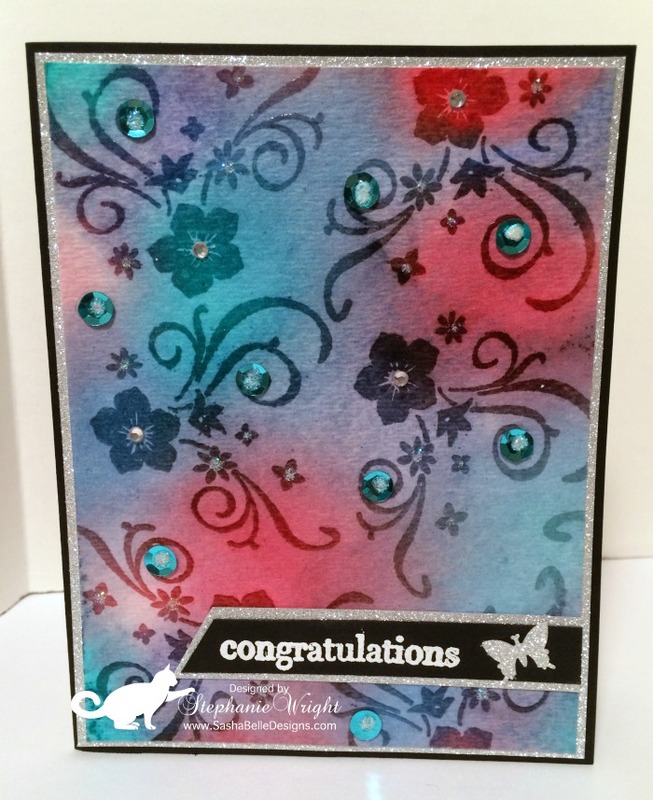 I used Memento Tuxedo Black ink for the sentiment and border stamping. 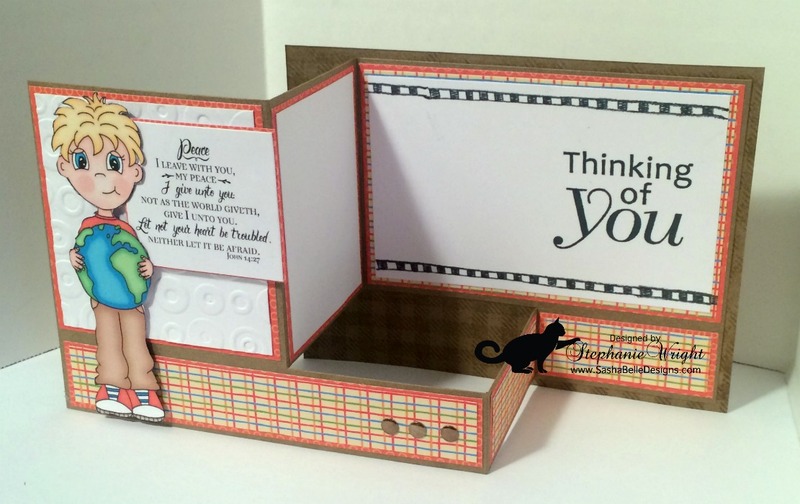 The base panel of the card was stamped with the Simon Says Stamp Gingham Background Stamp with Versamark Ink. I really like the subtle texture this stamp adds to the otherwise plain card base. Crop Stop is our other sponsor this week and they carry both the Memento ink and Versamark ink. Crop Stop has a lot of your favorite brands. Be sure to check them out. I really like the way the card stands up by itself for display. This is a quick and easy fancy fold card. I hope you'll give it a try. I used several retired items and items from my stash that had no manufacturer label. For that reason, I won't be listing my supplies with photos this time. However, I will give a supply list below. I hope you'll stop by the Word Art Wednesday blog to see the rest of the Design Team projects and to link up your own projects for an opportunity to win one of two great prizes. Thanks for visiting with me today.